For C-Power, building an offshore 325MW wind farm on the Thornton Bank in the North Sea, 2012 is the most important construction year. After the pilot project of the first six 5MW turbines, which have been operational since 2009, C-Power installed, in the course of 2012, 30 new turbines of 6.15MW each. This was an unprecedented feat globally, as it was the first time wind turbines with such high capacity were constructed seat such a distance offshore. The construction of the wind farm consists of three phases. The first phase, built in 2008, was a test phase. 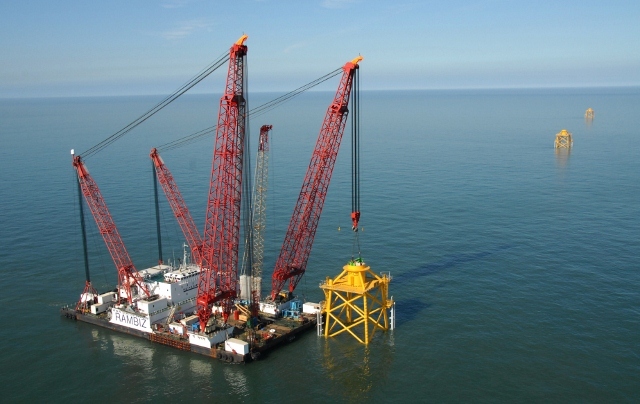 In March 2012, the second phase of turbine installation commenced. 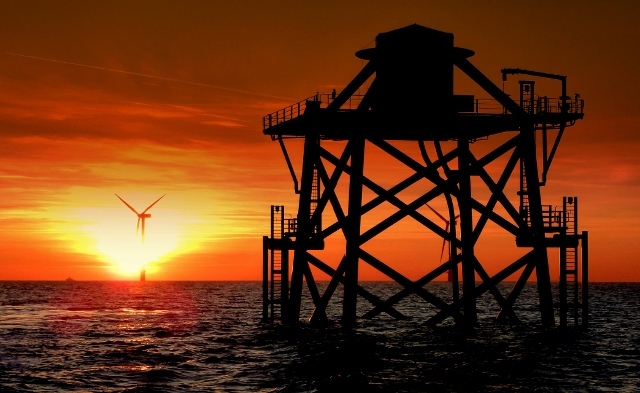 This year, 30 wind turbines were mounted on their foundations on the Thornton Bank in the North Sea. 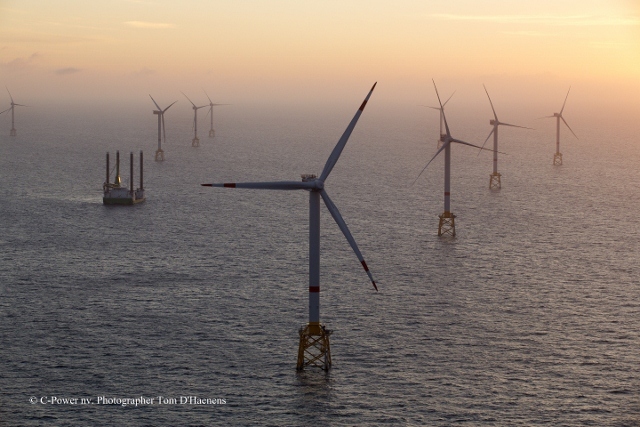 The third phase, in which the last 18 wind turbines are constructed, will commence in March 2013. With regards to the foundations, a switch was made from concrete foundations used in phase 1 to steel structures or ‘jackets’ in phases 2 & 3. Both on a financial and a logistic level the choice of jacket foundations offered advantages. Assembling these foundations was performed by Smulders Projects in Hoboken, a subcontractor of THV Seawind (joint venture between DEME and Fabricom established specifically for the Thornton Bank project). 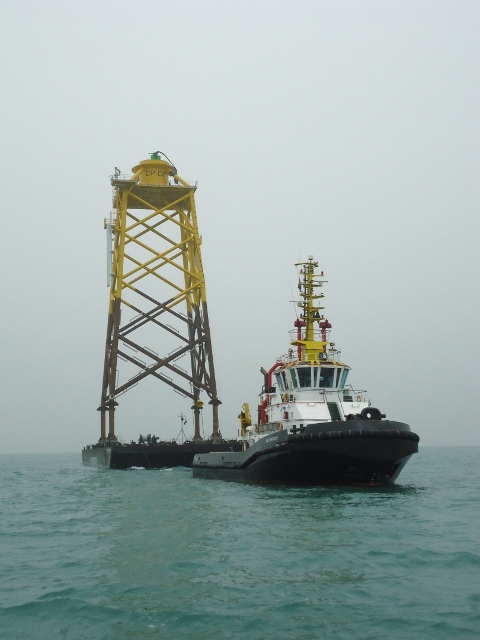 In 2011 the Scaldis heavy lift vessel ‘Rambiz’ installed 24 steel foundations at sea and completed this work in 2012 with another 24 foundations for phase 3. These foundations with an average weight of 500 tonnes have a height ranging between 37 to 47 m.
A specific foundation was provided for the Offshore Transformer Station (OTS). 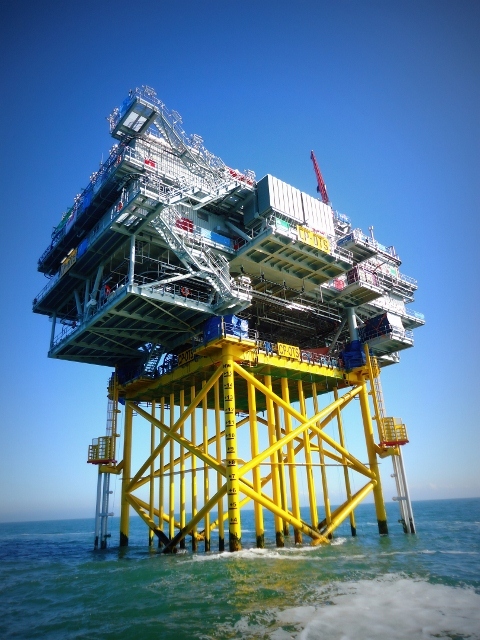 This foundation, with an overall weight of around 800 tonnes, was constructed in Lowestoft (United Kingdom) and has, among other specific features, a large number of J-tubes through which the electrical cables reach the transformer station. 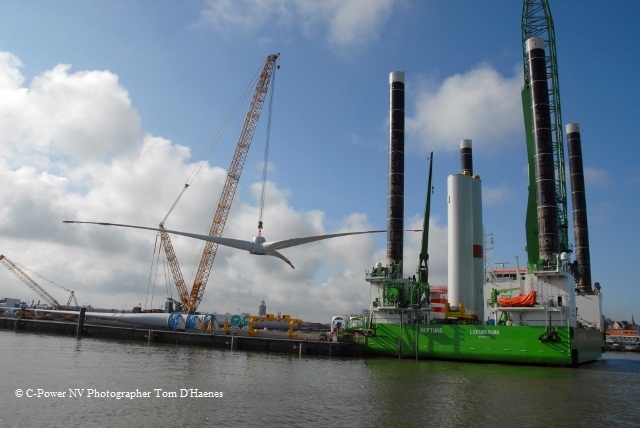 All turbine elements were temporarily stored on the REBO (Renewable Energy Base Oostende) site in the Port of Ostend. The two tower parts, the hub and the nacelle were brought in from Germany on pontoons. The 61.5 metre long blades from Denmark came in threes at night by means of exceptional transport along the motorway. The complete rotor was assembled on the REBO site. 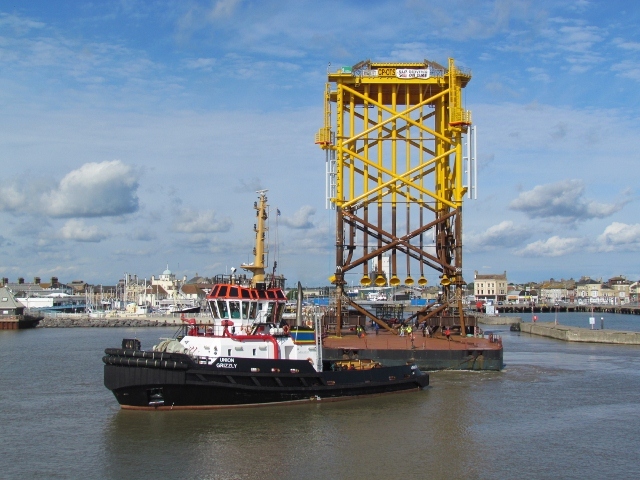 It was GeoSea’s (DEME) brand-new, 60-metre long and 38-metre wide, self-propelled jack-up platform ‘Neptune’ that brought the parts to the Thornton Bank. 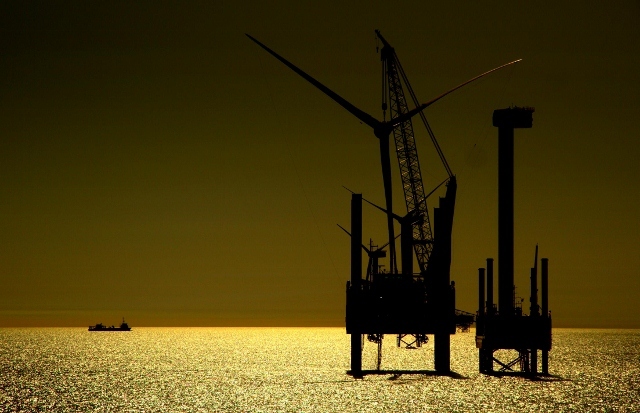 The Neptune can load all elements of one complete turbine, sail 40 km in the direction of the Thornton Bank and assemble everything there with a crane that can lift up to 600 tonnes, within an average time frame of three days and three nights. Much more frequently than onshore, the maximum allowable weather limits (wind, waves, etc.) are exceeded offshore, which means that no work can be carried out, or allowed to be carried out at sea. But despite the Belgian weather all 30 turbines were installed within the planned schedule. In clear weather it is possible to view and admire the wind turbines from the coast and even see the blades rotating. A crucial point in the construction of the wind farm was installing the Offshore Transformer Station (OTS) on its foundation. The platform, which weighs 2000 tonnes, has four floors and transforms the produced electricity from 33kV to a higher voltage of 150kV. The transformer station was built in Schiedam by ABB and again it was the ‘Rambiz’ that lowered the platform onto its foundation. The connection between the top structure and the foundation was welded tightly together in a period of two days. The electricity supply from the wind turbines to the OTS takes place via nine infield cables (per row of turbines) with a voltage of 33kV. After transforming to 150kV, two sea cables conduct the electricity to shore, where the connection with Elia’s high-voltage grid was made. The first cable, which has been in place since 2009, is the connection between the first six 5MW wind turbines and the onshore power grid. 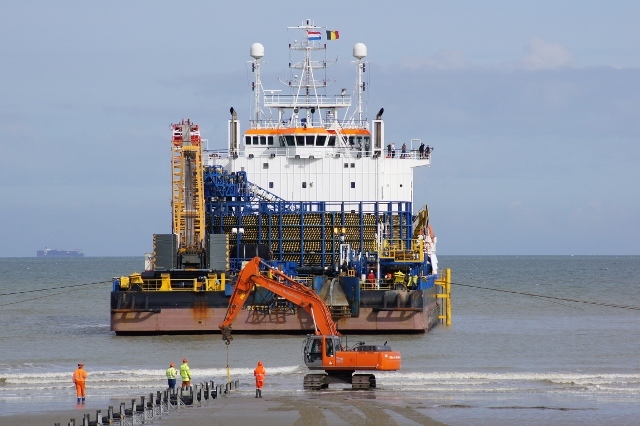 After installation of the Offshore Transformer Station in 2012 the second large sea cable had to be laid. This cable, with a weight of 3200 tonnes and a length of 40 km, was collected from the ABB factory in Karlskrona (Sweden) by the cable-laying vessel ‘Stemat Spirit’ and laid on the bottom of the sea with burial in the seabed carried out afterwards. 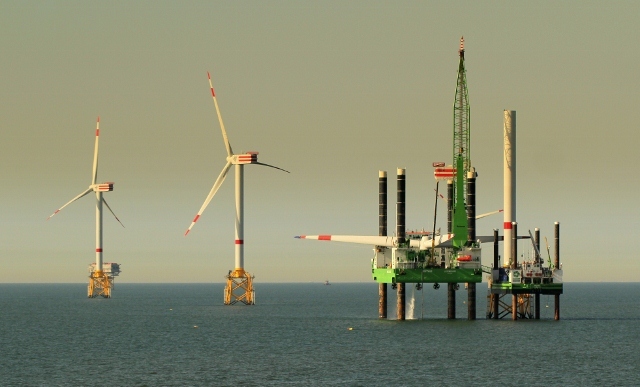 After the installation of the OTS offshore, the turbines could be connected per row (string) with the OTS. The OTS contains two transformers, which are separately connected to the onshore power grid by means of the two sea cables. 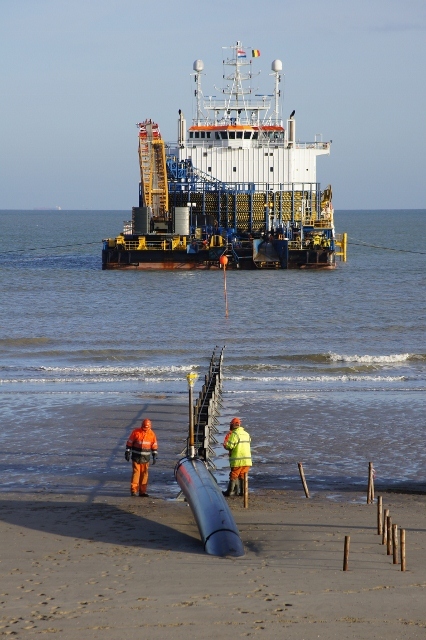 This connection is made on the Elia site (Sas-Slijkens in Bredene). In case of a fault in one of the transformers or one of the two sea cables, the other one is still operational and can function as a back-up. 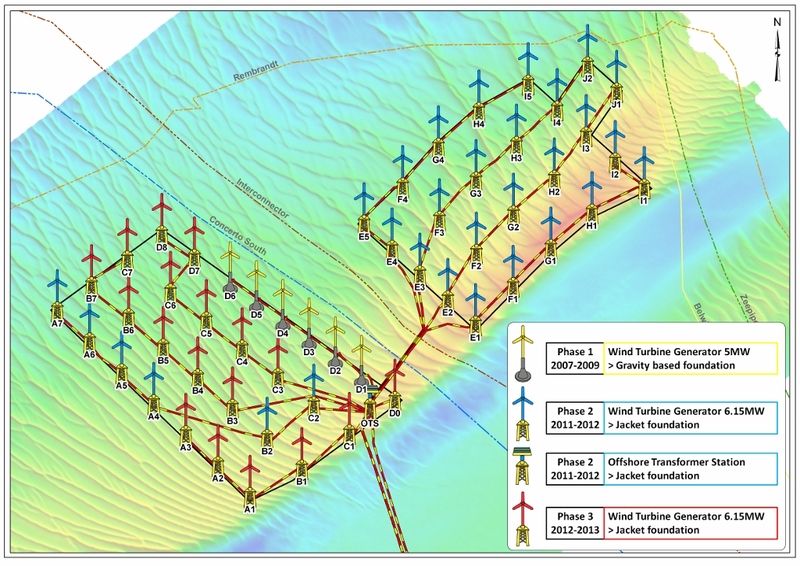 The connection cables between the turbines (infield cables) were also laid on the seabed and buried as soon as the foundations were installed on the Thornton Bank. 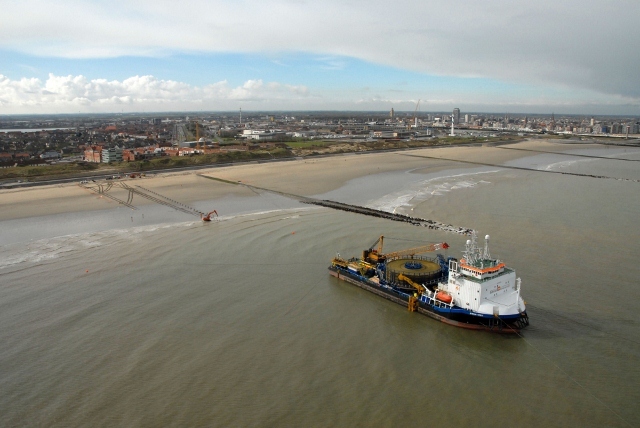 The cable-laying for phases 2 and 3 was completed at the end of summer 2012. There are a number of steps between the installation of the wind turbines and the production of energy, which are required to guarantee the functioning of the turbines. After Mechanical Completion, i.e. connecting all mechanical parts, the commissioning started. In the first instance there is Cold Commissioning, which means testing a number of parts without the turbine being connected to the grid. Once the cables are connected to the turbines, they can be put under tension. Then Hot Commissioning starts, which means testing under tension of all electrical components. Subsequently the turbine is put into operation step by step. Since a wind turbine of such magnitude cannot just start working at full capacity, the power is increased gradually. As soon as the turbine has reached its full capacity a test run is performed to assess whether the wind turbine is producing according to design specifications. When this complete procedure has yielded a positive result, the wind turbine is deemed to be finally delivered and accepted, the so-called Substantial Completion. Then the turbine is no longer in the construction stage, with the responsibility for operating transferred to the Operation and Maintenance team.